Mixolydian is a commonly used mode in many styles of music. Like other modes, Mixolydian offers unique harmonic and melodic qualities that you can learn to both recognise in existing music and apply to your own music. However, as modes and their function are generally not easily understood (nor very well explained! 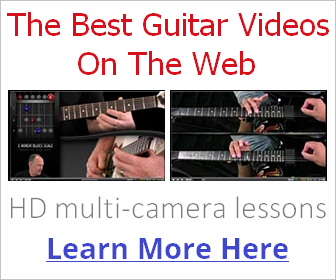 ), many guitarists end up missing out on the creative options they offer you as a musician. I hope my explanation in the video below, along with the ear training audio on this page, will prove a "eureka" moment for you in terms of finally unravelling the mystery of Mixolydian! Let's first get familiar with the building blocks that give Mixolydian its unique sound. Mixolydian can be seen as just another type of major scale (a scale that includes the intervals 1 3 5), with its defining interval/tone being the minor 7th (b7). Many musicians associate that flat 7th with a "country" or "bluesy" feel which gives Mixolydian, as a scale, its distinctive flavour. It's the b7 that differs Mixolydian from the natural major scale (Ionian), which uses a major 7th (7). Listen to the clip below where I play through the sequence starting on 1, stopping to emphasize that minor 7th tone. Hearing it in relation to the other tones like this, especially the 1, is a good way to internalize Mixolydian. Next, the roadmap to show us how the intervals of Mixolydian appear on the guitar fretboard. Starting with two common patterns - one built around an E string root, the other around an A string root. By using these E and A string reference points, you'll be able to locate them based around familiar chord shapes in the same position, such as the E and A form barre chords. As Mixolydian is the 5th mode of the major scale, you can also use your knowledge of the major scale's patterns to cover more of the fretboard. Each Mixolydian root has a relative major scale root meaning, if you already know the major scale, all you need to do to is learn the corresponding root positions as shown in the table below. For example, if you wanted to play G Mixolydian, you could simply play it's parent scale, C major (as they both contain the same seven notes). This way, you only have to spend time learning one scale (the major scale) across the entire fretboard on different roots and you'll automatically know its seven modes starting from their related major scale degrees (e.g. 5th mode Mixolydian's root is the major scale's 5th note). To begin with, have a play around with Mixolydian over the A major chord track below (using the patterns above to help - position the 1 of the pattern on A and go from there). Try targeting (lead up to, emphasise) different notes in the scale, such as the major 3rd (3), and minor 7th (b7). These are the "colour tones" of the scale. You can also harmonize your scale movements by playing two notes at a time. Just explore the scale freely and intuitively, listen closely and get an ear for its sound. A Major 12 Bar Blues Backing Track (thanks to Phil Lewis for this free track). You can learn more about using Mixolydian specifically in blues right here. So, in short, Mixolydian will work over pretty much any instance of a dominant 7th chord. Remember that! Mixolydian also has a harmonic modal function, which basically means we can harmonize the scale to create a sequence of related chords. We might call these "Mixolydian chord progressions". Although songwriters don't typically set out to write modal music (as this would be creatively limiting), modal sequences often occur naturally in music simply because they sound good and meaningful melody/harmony can be easily extracted from them. Mixolydian has a unique attraction, because of its bluesy, rock 'n' roll feel. The "center" of any Mixolydian based progression can be identified as the V chord in major scale harmony (hence, 5th mode). This is because if we build a chord on the major scale's 5th degree, we get a major triad with a minor 7th (a dominant 7th chord). The V becomes I (1) to represent this new key center. As always, the best way to understand modal music is to hear it! Here are some common Mixolydian progressions with backing tracks for you to practice with. Probably the most common Mixolydian movement, and a strong clue the music is in that mode. It involves moving down one whole step from Mixolydian's major tonic to Mixolydian's 7th degree major chord, and then typically back again. Two major chords one whole step apart, in other words, with the higher of the two being Mixolydian's 1 position. An example of this can be heard in The Who's My Generation and the verse of Pearl Jam's Alive. Classic Mixolydian movement used in countless songs, such as Sweet Home Alabama and the verse of Sweet Child O' Mine. Here we're taken through the minor 5 chord to get to the 4. Can be heard in Foo Fighter's Learn to Fly and REM's Try Not To Breathe (they add in the 7 chord between the 5 and 4 but the effect is the same). Hopefully, by spending time practicing over these progressions, you'll develop an ear for that "Mixolydian sound". You'll be ready for it! I hope you enjoyed exploring Mixolydian!